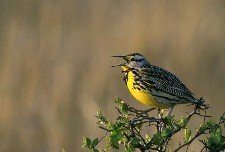 The two North American Meadowlarks, the Eastern and Western are so similar in appeareance that even side by side it would be difficult to tell them apart. Of course if the two were together, the Western species would be slightly paler than the Eastern. The song of these two birds is the best way to distinquish them from one another. A rather stocky bird measuring 8 to 10 1/12 inches in length. The outer tail feathers are white, the breast is yellow with the familiar black V. The upperpart is streaked. These birds usually nest on the ground in grassy fields or meadows. The nest is a domed cup of grass and stems and well hidden. The female lays 3 to 7 eggs that are white and completly spotted and speckled with brown. The female incubates the eggs for 13 to 14 days. The young leave the nest about 12 days after hatching. Usually 2 broods are raised each year. During the breeding season, insects such as spiders, grasshoppers and others are eaten. During the non-breeding season, these birds will eat wild fruits, grain, and wild grass seeds. These birds have a complex bill musculature that allows them to force the bill open with considerable strength. This allows them to insert the bill into the ground or grass tangle, then, opening their bill, they pry apart the substrate which allows them to get insect beneath the ground. When the bird bill opens the ground, the birds eyes rotate forward slightly allowing them to see directly between their jaws. This technique is referred to as "gaping". Gaping allows these birds to retrieve insects that other bird species can't get. Starlings, along with other blackbirds use the gaping technique to find food also.